The early months of a child’s life are extremely important to healthy brain development. 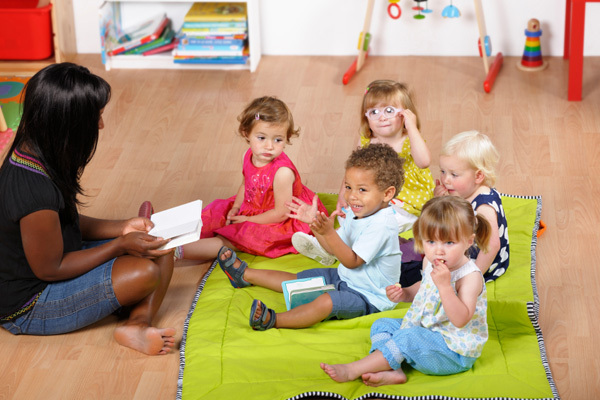 At Burns Daycare and Pre School Center our highly trained staff works one on one with your child to help them grow, gain mobility, and focus on sensory development. Our infant childcare curriculum is focused on developing your child’s five senses to foster the progress of intellectual and social skills. During active times throughout the day your child will be carried, talked to, and played with; while feeding, diapering, and sleeping compose much of the infants remaining time. Our facility is set up in such a way that offers a healthy, secure environment; promoting, both, physical comfort and emotional security. Our staff is dedicated to working hand in hand with you to make sure that your child’s needs are being met throughout every moment of the day. We take great care to follow all of your preferences regarding your child’s care as they are with us. We also report any milestones they may achieve while, in our care, as your child grows and develops.